The ACM Hypertext 2016 conference will focus on missing links on the WWW: how can the Hypertext paradigm and research inspire and improve the Web? Which missing links (and linking paradigms) can improve connections, communication and collaboration? Apart from the regular research tracks, Hypertext 2016 will feature a creative track. 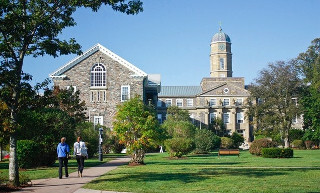 Hypertext 2016 will take place at the campus of Dalhousie University in Halifax, the capital of Nova Scotia and the major cultural centre of Canada’s Atlantic provinces. The deadline for the Extended Proceedings is 6 May 2016. Check out the calls for the Creative Track, Late-Breaking Results, Demos and the Doctoral Consortium. Or consider to submit to one of our workshops. In the wake of a booming resurgence of interest in creative hypertext over recent years, we are increasingly seeing new directions and possibilities for artists exploring the creative potential of the link. This year, we are delighted to offer a space for exhibition and performance of creative hypertext works at the conference venue. Other presentation formats are welcome and should be described in the proposal. We are especially asking for work that can be presented or demonstrated in 10 minutes even if the work might take longer to fully explore all content. Because of space limitations, works not exhibited via computer, tablet, or mobile device may not be accommodated; please specify your requirements in your proposal. We are not able to accommodate installation pieces. Submissions should follow the same guidelines as the full papers. The page limit is 4 pages, including references (if any). All submissions should be formatted according to the official ACM SIG proceedings template and submitted through the EasyChair ACM HT 2016 Extended Proceedings site, designated as a “Creative Track” paper. Only PDF documents will be accepted.